Home » Caretaking » 10-6-2018 National Public Lands Day: plantings & cleanup! 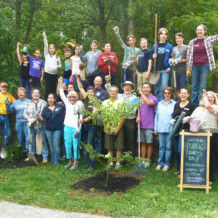 For National Public Lands Day*, the Friends of Glen Providence Park will again plant native trees and shrubs in the glen. This is our 7th annual planting project, working to improve wildlife habitat, reduce erosion, and beautify the park! Native Tree & Shrub Planting! Our planting day is one of our most popular and fun events! We are incredibly grateful to Delaware County Parks & Recreation for providing funds for this project, and to the Delaware County Conservation District for the use of its Conservation Planting Trailer and supplies. This year, we’ll be planting along the 1941 Trail, which suffered the loss of several trees in last winter’s storms. The trail is named for the Glen Providence Nature Guide from 1941 that we discovered, which leads the visitor on a self-guided tour through the park, starting down the 1941 Trail! It’s our second tree planting this year, after working with Media Rotary, Media Providence Friends School, and Delaware County on canopy tree plantings for Earth Day this spring. To help us plan our time effectively, and to plan for refreshments, we ask that you RSVP for this event at FriendsoftheGlen [AT] gmail.com – please let us know the number of volunteers in your party. We will update this description as we identify other relevant details for volunteers. Please contact us to register. Lunch and drinks will be provided for registered volunteers. Of course, we also welcome anyone who wants to participate by picking up trash along the trails and stream! We will provide the equipment, including shovels, spades, rakes, and wheelbarrows – but if you have favorite tools, feel free to bring them! Our rain date is Sunday, October 7 at 9:00 am. If the weather is not clear, we will post here and on our facebook wall by 8:45 am Saturday advising whether we will use the rain date. Thank you, we hope to see you on National Public Lands Day!